Palm gives adult coloring a new twist in book. I believe humor is a great way to stay healthy. What happens to your memories when they’re not relevant anymore? 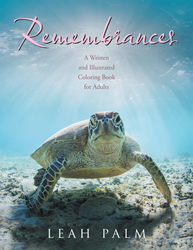 In her new book “Remembrances,” author Leah Palm provides readers with fun memories from her own past that many people are able to relate to and coloring pages that go along with each story to keep people of all ages away from depression and engaged in activities. Palm is a retired occupational therapist and also an army veteran with 33 years of total patient care experience. Living in an independent living home herself, she found remembering the past and participating in coloring activities often helps her and others stay happy and active. Leah Palm is a seventy-seven-year-old novice writer. She was born in Everett, Massachusetts, on April 23, 1938. She paints paint-by-number scenes to pass the time, and it adds pleasure to each day. One day, after perusing through her thoughts for several years, she decided to create a written and illustrated coloring book for adults. The book was to develop from older people’s remembrances. Palm grew up as an army brat. She also spent twenty-two years in the US Army, Army Medical Specialist Corps, from 1965 to 1987.